My essays have been keeping me busy, which means less time to gallivant. But I haven’t stopped eating, so here are some food highlights. 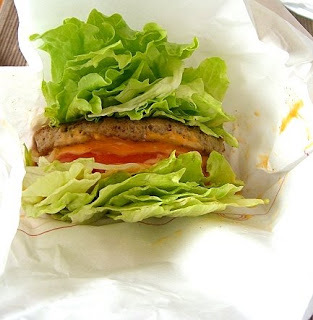 Mos Lettuce Burger for lunch. I’m not sure what was inside it, but I think it was teriyaki chicken. For dinner, Kaori-san cooked aji-fish, which is a grilled, salty kind of fish. It is served as a whole fish (meaning that it isn’t chopped up and you can clearly see the shape of the fish). It has a lot of small bones in it, and it is a skill in itself to be able to eat the fish without getting the bones in your mouth. As Masaki-san showed me, you’re supposed to peel off the outer skin of the fish which is slightly protruding, and the bones come out along with it. Another new item on the menu was Nameko mushrooms in miso soup. Nameko mushrooms-often eaten with Miso soup. They have a slimy texture which make them really easy to chew. 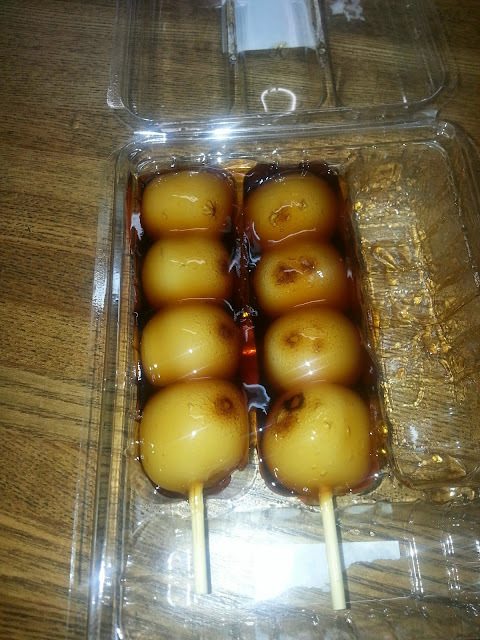 Mitarashi Dango: consisting of mochi rice balls topped with a sweet type of soy sauce. It’s a must have Japanese dessert . I can’t believe I tried it after three weeks of being here. On day 25, I decided to grab a sandwich for lunch to eat in class. Kaori-san suggested I go to Doutor, a popular coffee chain in Japan. I grabbed a salmon sandwich (I love the omnipresence of salmon here!) which wasn’t half bad for the price of around 400 Yen. Dinner was a western meal, consisting of clam chowder and bread. This was my first time eating clam chowder.It was a great meal way for a rainy Tuesday. It had been raining pretty heavily in some areas of Japan, one of which was the target of a hail storm. Apparently, it isn’t normal. Such hail storms are the affect of global warming and are a fairly recent phenomenon.